Which Soap Cutter is for You? Which soap cutter is best soap for you? There are different kinds of cutters: air powered and manual. They come in different styles like smooth or crinkled. Some cut large to medium size batches of soap to individual bars, at once. Some cut small loaves to individual bars, at once. Some cut one bar of soap at a time. Some are used, specifically, for cutting edges. Whether you're a soap business owner or a hobbyist, invest in a good cutter. Good quality soap making equipment saves time, energy and money. Making homemade soap is fun when safety precautions are heeded. Large professional soap making companies use air cutters that are pneumatically driven. Soap loaves are cut into hundreds of bars in minutes. This machine cuts hot process and cold process soaps with ease. It is not used for melt and pour, glycerin soaps. It's a powerful and quiet machine. -- Professional soap making companies and hobbyists use manual cutters to cut large blocks of soap into perfect size bars in minutes. This cutter has custom designed grids for loaves and bars. It cuts cold process and hot process soaps, easily. Not used for melt and pour, glycerin soaps. -- Loaf soap cutters are used by professionals and hobbyists. These cutters have a platform base. Just raise the handle and the many spaced words come down to cut the loaf of soap into multiple, individual, bars. No set up is required for this cutter. It's easy to use. Not recommended for melt and pour, glycerin soaps. -- Hand held soap cutters are used by professionals and hobbyists. They have handles that prevent slippage when holding. They're available in smooth and crinkle styles. A sharp, deep, wide, stainless steel blade cuts individual bars of soap from loaves, easily. They're used with cold process, hot process, melt and pour glycerin soaps. No set up is required. They're easy to use and store. -- Hand held half round cutters cut entire soap loaves or individual bars into half moon shapes. No set is required. Used by professionals or hobbyists. They're easy to use and store. -- A sharp butcher knife or chef's knife cuts individual bars from loaves. Just make sure that the blade is wide enough and able to cut all the way through the thickness of the soap. Blades may need re-sharpening, periodically. Use a precision sharpener for butcher or chef's knives. These cutters are convenient, easy to use and store. They're used by professionals and hobbyists. 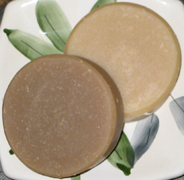 -- Soap edgers are used to smooth corners and edges of soap. A rounded edge is more comfortable for handling than rough edges. It provides a more professional appearance of soap. Some use a potato peeler as an edger. Some potato peelers have swivel blades that glide over uneven edges, easily. Careful! A potato peeler has sharp blades. Catch the soap shavings in a bowl, while edging, for no messy clean-up. Use the shavings to make another bar of soap! Be economical! These soap cutters use no wires. They're convenient, easy to use and store. Used by professionals and hobbyists. CAUTION! Keep cutters away from children and pets. They have high powered air, sharp blades or wires. Learn how to make soap, safely, with cutters. Read safety and handling instructions. Avoid disasters!